Since beginning at McNally Jackson ten years ago, Javier Molea has stretched his title as bookseller to its absolute limits. In the process, he has positioned himself firmly at the crux of a burgeoning New York Spanish-language literary community. On the side, Molea has launched a bilingual publishing company, DiazGrey Editores, showcasing titles by Lina Meruane and Enrique Winter (and looking forward to a new book of Alejandro Zambra poems in the fall). Molea’s most recent project is La Universidad Desconocida, a series of writing and literature workshops. Originally from Montevideo, Uruguay’s only city, Molea earned an advanced degree in literature from la Universidad de la Republica before making the journey to New York in 2002. After washing dishes at a Pakistani restaurant in Queens, making macchiatos in a Brooklyn coffee shop, and hanging Christmas decorations in Union Square, he became the manager of a plant design company. For seven years, Molea pruned and watered at law firms and hedge funds. One of his weekly visits was to the publishing company where Sarah McNally worked. The two became friends, and when she decided to open the bookstore, McNally knew whom she would hire to manage the Spanish language section. On any given day at Soho’s McNally Jackson Books, Javier Molea might be adjusting the margins on a book he is publishing, curating the Spanish- or French-language shelves, recommending an up-and-coming writer to a customer, or caring for the store’s greenery. He attends to all of these tasks with the same commitment and care. The books he publishes are cutting-edge, the foreign literature sections exceptionally well-curated. In the twelve years he’s been in New York, Molea has become something of a legend among Spanish-language writers and literary scholars. Javier and I sat down in his cozy Brooklyn apartment—where he’s been trying to build shelves to keep up with his ever-expanding book collection—to discuss how he became one of the most important figures in Spanish and Latin American literature in New York. Dana Khromov: Did your first few years in New York change how you viewed literature? Javier Molea: They changed the way I see the world more. Being an immigrant is like being a second-class citizen. There’s the society of white Americans, and there’s the underworld working to maintain that society. Because of my ideological formation, I felt very comfortable in that underworld. I realized that even with the millions of hispanos, and with Spanish as the second-most populous language in the States, Spanish-language culture in the United States is just another sales niche in the market. Art with a capital A is always in English… What I’m trying to say is that, with few exceptions, there is no connection between the Spanish literary world and the English one. Any literary event in Spanish is allocated to the community events section of the newspaper, while a literary event in English is highlighted in the culture section. How did you react to this situation? What I have tried to do is to have our events appear in the culture section of the papers. I started having events in Spanish with the best writers from Latin America and with Latin American writers at universities [here in New York] who didn’t have a place to present their books or could only do it at Cervantes, which is the same as presenting in Spain. Basically, no one knows what great Latin American writers are teaching in New York. These writers have nothing to do with what in the United States is called Latin culture. In some way, they do not fit into the general image that Americans have of Latin America. How do Americans imagine Latin America? Americans have a stereotyped vision of Latin America that makes them seek out and read a specific type of Latin American literature. Or it makes them read all Latin American literature in a certain way and identify everything that is written in Latin America as a product of magical realism, of the violence in Mexico and Colombia, or a romanticized reading of revolutions of the 1960s—this type of reading disregards writers who are fundamental in Latin America but are unknown in the United States. Many writers have been published for geopolitical reasons—for example, Caribbean people and Mexicans, because of proximity—or in order to create a literature for the immigrant community. And also because the publishing industry in the United States (except for a few companies like New Directions, Open Letter, and Other Press) is pretty ignorant of what is going on in Latin America. And for poetry, the situation is worse. What writers have not been published in the United States because they don’t fit this stereotype? Did you think your work might change how Americans think about Latin American literature? Do you intend to complement this work with DiazGrey, your publishing company? Precisely what we do in the bookstore is spread awareness. There are cultural products in Latin America that are important not only for the Hispanic community in the United States. They are literary products that are included in the global literary tradition, not just in the folk tradition of a community. DiazGrey publishes unique authors that defy the stereotype (that we were talking about before) and specializes in bilingual poetry. What is your work’s place in the bookstore as a whole? What we have sought is a dialogue between Latin American and North American writers. Siri Hustvedt, Jonathan Lethem, Mark Greif, Charles Bernstein, and others have come to the events in Spanish before coming to events in English. When we created this space, we wanted to accomplish three things: one, help readers become familiar with Latin American writers; two, establish equity between the two literatures (which is to say that Sergio Chejfec can be as good as Jonathan Franzen and probably better); and three, create a bilingual space between two literary traditions. 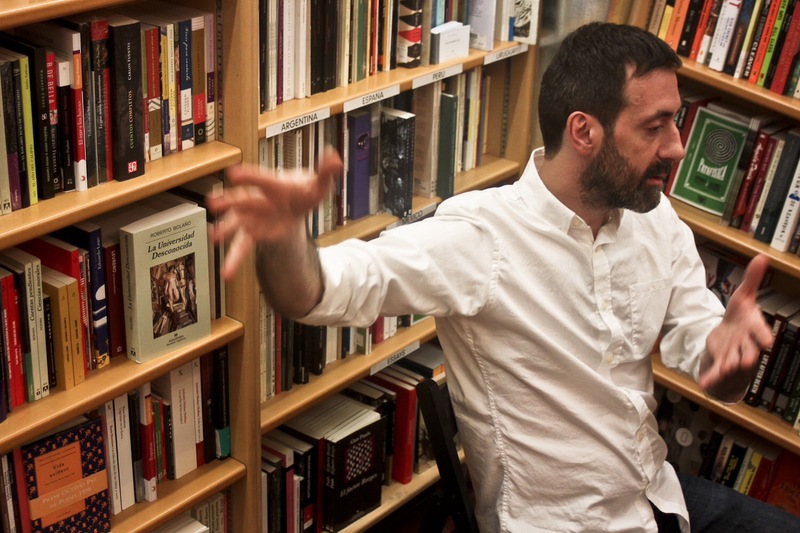 McNally Jackson has become central to the growing Spanish-language literary community in New York. How did you develop this community and how has it changed in the ten years you’ve been at the bookstore? Everything started when I started to do free Spanish language workshops on Saturdays in the bookstore. We’ve continued to do them for the last eight years. And then the book club, which (along with Sarah McNally’s), is among the most important in the store. But most important are the book presentations on Saturdays and Sundays. At first, the events were small compared to the ones in English, but recently we’ve had audiences of the same size, sometimes even larger. And our events differ from academic ones. They’re not like the cliché where the writer sits on a stage and talks. A bookstore is a more intimate space, and we like the writers to connect with the audience and interact with the readers. We don’t want them to dictate from a podium. What are some of the events you organized and/or hosted that you’re proudest of? All of the events are good. In addition to bringing great writers, we give new writers the opportunity to present their books even if no one is familiar with them. But there are some events that I recall with great affection because we had a lot of bilingual people in the audience. For example, that of [Enrique] Vila-Matas and Sylvia Molloy, those of Sergio Chejfec presenting his books in English, Luisa Valenzuela with Siri Hustvedt, and Jonathan Lethem and Carmen Boullosa talking about [Roberto] Bolaño. And that is how I hope the upcoming event on February 28 with Alejandro Zambra and Francisco Goldman will turn out. You’re working on a new project, La Universidad Desconocida, as well. Yes, it’s a project that I started with my Spanish friend, Maria Bordallo, and it complements the work DiazGray and McNally Jackson en Español do. La Universidad Desconocida is an opportunity for people who want to write and get training from the best Spanish-language writers. When someone participates in our workshops, she receives classes from writers like Lina Meruane and Mónica Ríos, for example. Except for the program at NYU, there are no other workshops in the city for Spanish-language writers. It started as a project among friends, but has grown beyond our expectations… We’re lucky to have the support of writers like [Enrique] Vila-Matas, Junot Díaz, Diamela Eltit, and Sylvia Molloy. This interview was originally conducted in Spanish and can be read in its entirety here. For Asymptote’s July 2014 issue, we are seeking translated fiction from Latin America. Check out our submission guidelines and submit! Dana Khromov, Asymptote editorial/marketing intern, is a Brooklyn-based writer. She graduated from Ithaca College with a bachelor’s in writing and is currently translating a series of short stories from Spanish to English.